Your financial support allows us to form partnerships in states and cities across the country, arming advocates and policymakers with the tools they need to safeguard access to abortion and contraception. Make a tax-deductible donation today! We accept gifts of appreciated stock, bonds, and other marketable securities. To make a gift of stock, please contact development@nirhealth.org or call (646) 520-3508. To make a donation through wire transfer, please contact development@nirhealth.org or call (646) 520-3508 for account information. You can recommend NIRH as an organization to support through your Donor Advised Fund. To learn more about designating a gift in your will or living trust, please contact development@nirhealth.org or call (646) 520-3508. 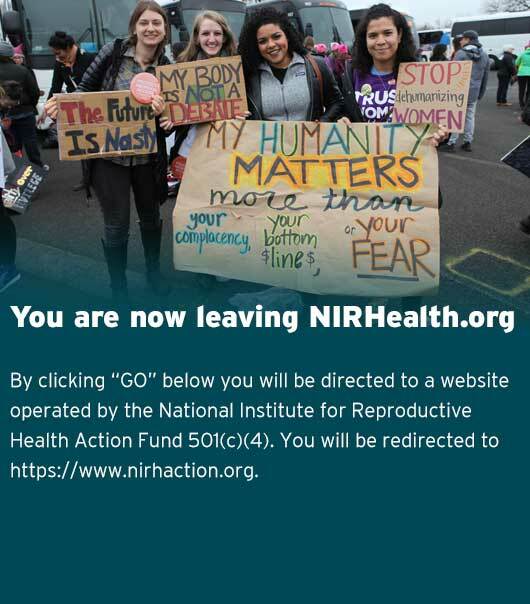 You can support NIRH when you shop on Amazon by visiting www.smile.amazon.com and selecting National Institute for Reproductive Health as the organization you’re supporting. A copy of the organization’s latest financial report may be obtained, upon request, from the National Institute for Reproductive Health (14 Wall St, Ste 3B, New York, NY 10005) or the Charities Bureau (28 Liberty St, 15th Fl, New York, NY 10005).